Any respectable binary options broker will have a variety of assets for you to trade. Brokers will offer a range of commodities (oil, gold etc. ), currency pairs (EUR/USD, JPY/USD), indices (Dow Jones, S&P 500), and an array of international stocks. The beauty behind this diverse amount of potential underlying assets is the ability to diversify your portfolio as well as trade in the market that most interests you 24 hours a day. The best brokers offer a variety of international stocks. Succeeding with binary options requires you to be aware of the latest news and events across the financial markets around the globe. If you are not willing to read what’s happening, then you won’t catch the market moving in your favor. Binary stock trading is an exceptionally great way to take advantage of market trends, because most likely you are already following the market. When is the next iPhone being released? Did Facebook just make a major purchase? Chances are you can answer these questions. This means you are already following the market. If you know when the next iPhone is being release, you are following the stock of Apple (AAPL). If you know if Facebook is looking to purchase new technology like WhatsApp you are following Facebook (FB). Since you are already following the market, you just need to read financial news with an eye for how it affects stock price trends. Follow an industry to win at binary stock trading. Since you are already interested in tech giants like Apple and Facebook, following other industry giants is probably something you’ll enjoy. One of the biggest advantages to trading with binary stock options is that stocks are heavily linked to the performance of an overall sector such as: Finance, Technology, Energy etc. Grouping companies by industry is a great way to get a sense for the health of companies who provide a similar service. Top investors specialize in a specific sector and rarely venture of outside their circle of knowledge. That is to say, an expert in Energy won’t invest in the Finance industry simply because they don’t know so much about it. You can see from this simple example that the above three companies are in the same industry because they more or less serve the same market. Since most companies provide products or services for defined industries or sectors, information in the public domain on that industry may also result in a movement in price in that particular stock. It’s not a hard and fast rule but it can help the trader to make informed predictions on how the stock price may move over the short-term. Furthermore many of the top industries are already measured in one index. Many regular stock trading companies such as Vanguard offer an industry specific ETFs. An ETF, Exchange Traded Fund, is essentially a financial security that can track among other things a basket of related industry specific stocks. 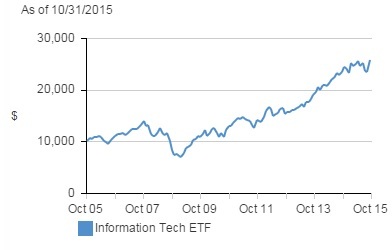 You can see from the above Tech ETF graph from Vanguard, that the performance of tech stocks is trending up. From this you should investigate further, pick a stock and see the trend, and finally purchase a CALL or PUT binary stock option depending on what your research tells you. What if I’m not interested in tech stocks? 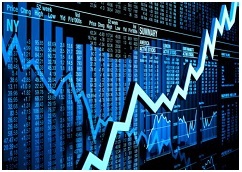 These binary stock options are also offered across a wide range of industries, including technology, telecommunications and financial services. Technology firms include the likes of Google, Apple and Dell while telecommunications stretches across borders including Qualcomm, Deutsche Telekom and Vodafone. These international stocks provide an opportunity for traders, who are looking to benefit from short-term movements in price of the stock. As mentioned above, any broker worth its salt will have a variety of stocks to choose from. One of the leading brokers in the industry offers its clients the option to choose from the following stocks covering all sorts of industries. It doesn’t matter which industry or sector you choose to research, or which you are already following. The key is to start reading the financial news you already read as investor and not as a consumer. Follow the steps laid out for you in the above article.